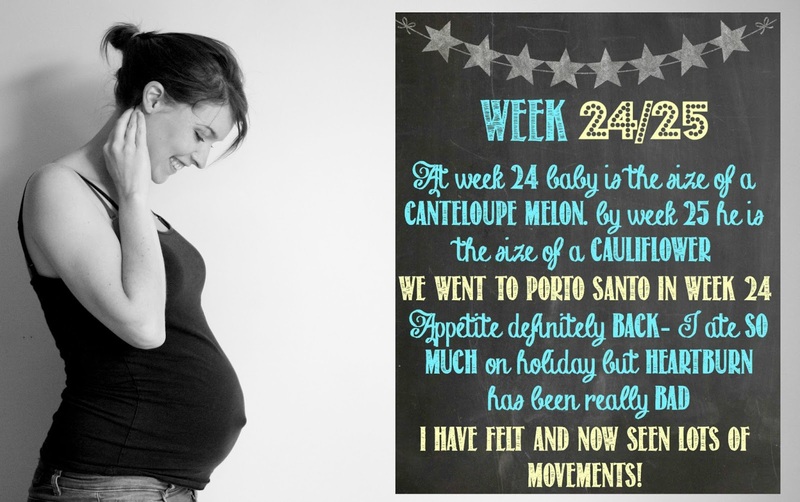 I'm doing a little bit of a combined bump update this week as I was away in Porto Santo when I was due to do my 24 week update so thought I'd roll two weeks into one. I ticked over onto 24 weeks on the Friday I was away, and my oh my, did I grow over the course of that week! I put it down to the amazing all inclusive food we had access to. My appetite came back with a vengeance and I really could not stop eating! It wasn't all junk though, and managed to grab a fresh fruit smoothie every day, along with slices of watermelon, golden melon and fresh pineapple, which although utterly delicious, left me with horrible heartburn. Not a good time to run out of Gavison when there's no shops nearby! Alongside all the ice cream, desserts, bread rolls and potato based goods, I also enjoyed loads of fresh salads too, and to my surprise, I hadn't put on that much weight when I got home. When I was away, I plucked up the courage to wear bikinis instead of a tankini or swimsuit. I wasn't sure about it as I really lack body confidence and felt like everyone would stare at my huge belly, and while I did get a few glances, I think they were actually just interested more than anything. One lady asked how far along I was and was surprised when I said "6 Months" to which she replied "Gosh I thought you were nearer 8 months!". To be fair, I do think I am carrying quite a big baby for my small 5ft 4 frame. 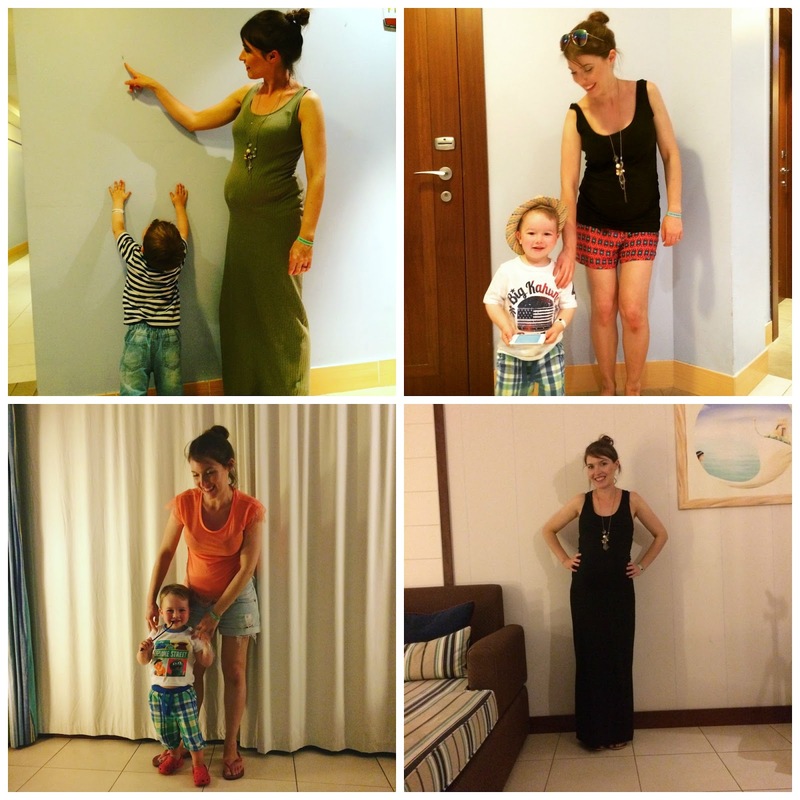 When I'm on holiday I always seem to have a bit more confidence to wear more exciting outfits, rather than jeans and a top all the time, and I loved the chance to wear lots of my new maternity clothes, especially my maxi dresses. (I've shared a few of my favourite outfits from holiday below). I have felt so much movement recently too, and even started to see baby boy moving under my skin. Even though I've experienced it before with LO, it still took my breath away! I felt incredibly well over the holiday and in the week afterwards, and my skin has been looking healthy too. Many people have commented on how relaxed I look, and I do feel really good at the moment, with just the odd episode of heartburn. Maternity clothes? Yes, and I wore them all holiday! Now needing to wear long vest tops and maternity tops but still in regular jeans. Miss anything? Being on holiday! Food cravings: Coco Pops- it gets to 9:15pm and I really crave them. What an amazing bump you have. And I don't think you look big at all for 25 weeks.